The crisis between the Flemish and francophone Belgians continues. After 172 days without a government and big provocations by the Flemish political class, has Belgium come to a point of no return? 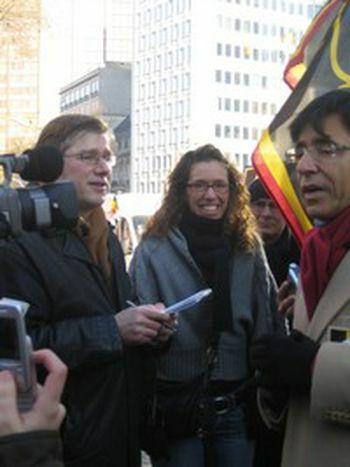 Marie-Claire Houard collected 140, 000 signatures, prompting a proitest in favour of the union of Belgium - 35, 000 people demonstrated on 18 November in Brussels. The rest of Europe seemed to have only just discovered the crisis crippling Belgium. Jean Quatremer, veteran European affairs correspondent for leftist French daily Libération from Brussels over the last fifteen years, analyses the situation. Thank God we are not in the Balkans. In Belgium no-one has got plans to arm themselves! But this country is clearly in the middle of a very serious crisis which could divide it in the future. It doesn't necessarily have to happen in such a short time. A nation has been born in the north of this country: Flanders. The francophone south and Brussels haven't realised that this change has taken place. However Flanders demand their independence. We need to know that Belgium was created in 1930 because of a decision taken by France and England. The people didn't have anything to say. The state passed reform after reform and ended up building a wall between both communities. A wall in the hope of being a border. And it's all rising at this 'border'. Is it so bad that a country splits into two? I'm not convinced. One of the founding countries of the European Union, a model of cohabitation between peoples ... isn't this division a new questioning of the European model? I don't think that this would go against the European project. This is all based on the principle of volunteering, on the right of the autonomy of the peoples. And now we have a region, Flanders, which doesn't want to be united with its French neighbour any longer. But the Flemish want to continue working together, be it in a European Union of 27- or 28-member states. It's also thanks to Europe that the Flemish nation could emerge. Since it's very foundation, this was exactly what the EU always wanted: to weaken state competencies. What would happen in European institutions if both regions contested Brussels? The Flemish aren't complaining about Brussels. Although it is their historical capital, it has always been francophone. What's at play for the Flemish politicians who are in charge is the stabilisation of their territory, blocking the expansion of the francophone danger posing around Brussels. The French don't see any possibility in negotiating a division without considering Brussels as an agglomeration. What we have here is a true obsession by the francophones. And as a result you can envision some explosions of violence. The European institutions don't run a risk. The proposal made by Charles Picquet, president of the region of Brussels, seems feasible to me. He proposes a 'city-state'. Brussels would be enrichened by what would be a tax of the institutions. What's the word from the corridors of the commission and parliament? What are their fears? Actually it's quite funny – no-one is talking about the issue! No-one talks about what's happening. It's a real denial of events. If they did talk about it, it would mean that separation would be a done deal. So you just have everyone looking the other way with fingers crossed.